Welcome and Happy Valentines Day! I’m currently on a music cruise with my father-in-law right now! His name is Patterson Barrett (click his name to check him out!). Patterson is a musician and was invited to play with Buddy Miller on the cruise. Josh Ritter, who is my super favorite artist, is also on the cruise and Patterson was allotted a spot for another person so he took me! I’m spending my Valentines Day listening to great music and drinking a beer. I hope you’re enjoying yours like I am mine! ON TO THE HOP! 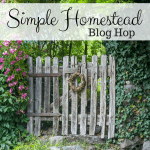 About the Simple Homestead Blog Hop #195! The Simple Homestead Blog Hop #195 runs from Thursday morning to Sunday evening, so spread the word and spread the love. Share your best material and check out someone else’s best material, too (maybe leave a comment letting them know you found them here at the hop!). Be sure to follow your hosts to let them know you’re here, as well! Personally, I love to use blog hops as a source of pinning material for Pinterest. I find a few posts that I really love and pin away!